On Thursday 30th May, 30 members of North Wales Police will be climbing Snowdon in the early hours of the morning to raise money for Hafal. 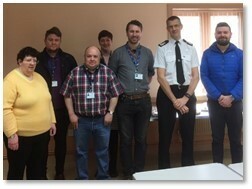 This comes after North Wales Police kindly chose Hafal to be the official ‘force charity of the year’. The group will be setting off at 1am in the morning and will be aiming to reach the summit of the highest mountain in Wales to watch the sunrise. Sergeant Tom Prytherch has organised this event as part of his ‘Cerdded Cymraeg’ initiative which encourages police officers, staff, friends and family members to get some exercise by walking and to practice chatting in Welsh. A huge thank you to everyone at North Wales Police for this fantastic effort. Good luck!